In 1891, Luigi Lepiane arrived on the shores of Ellis Island from Piane Crati, the smallest village in Calabria, Italy. Single, alone and carrying everything he owned in a few satchels, he made his way to San Jose, California. There, with little more than an immigrant’s dream to his name, he met his future wife, Rosanna, and together they made their way to the nearby farming community of Hollister, near Gilroy, in 1917. Luigi went about chasing his vision of owning a grocery store and a little winery. As is the case with many immigrants, the Lepianes longed to connect with other Italian immigrants, and soon they were holding frequent celebrations, and became known throughout Hollister and San Jose for an always-abundant table, generous helpings of wine and the sharing of old-country customs. Their fellow countrymen came to anticipate the Lepiane’s annual “Feast Day of Santa Barbara” celebration, held every December in their home in honor of Luigi’s most beloved Catholic saint. Old newspaper articles from that time report that the local toastmaster once bestowed upon Rosanna and Luigi a symbolic gift from the local community: two high-backed chairs symbolizing a “seat of honor” for each of them among their townsfolk. Luigi finally launched his wine brand, under which he made, among other wines, an off-dry Tokay. Yet, only four short years later, he was stricken with colon cancer and died shortly thereafter, and his wine dreams died with him. One-hundred and twenty-two years later, his great-granddaughter, winemaker and passionate California surfer Alison Thomson, launched her own wine brand in 2013 and named it L.A. Lepiane Wines, in honor of Luigi Antonio Lepiane. Luigi's Tokay wine label (left) and Alison's Grenache wine label (right). When I arrive at Thomson’s small, modest seaside home for our interview, she is preparing a hearty, home-made Pasta e Fagioli for our lunch. I can smell it as I get out of my car. Just yards from the Pacific, along the Goleta shoreline of Santa Barbara County, there is a dirt pathway that leads from the front door of their rental down to the ocean. Along the pathway is a row of dilapidated greenhouses filled with mangoes, guavas and bananas. While Thomson sets the table, I make my way around the small house she shares with her husband, George, and their children, Mick and Julia. Through the kitchen window, I see a couple of surfboards propped up against their backyard fence. Their walls are a veritable gallery of children’s artwork. At five years old, Julia is going through a butterfly phase, and so one wall is nearly covered with colorful drawings and paintings of these little winged creatures. Their toys lay about on a collection of mismatched furniture that Alison has found mostly by visiting thrift shops; she enjoys collecting old furniture, maps and art that others have owned because these objects have character, and their own secret stories to tell. In a few days, it will be December 4th, the Feast Day of Santa Barbara, and Thomson plans to celebrate the day with a few friends over a bowl of Burbara, a traditional dish made of boiled wheat grains, pomegranate seeds, raisins and anise usually served on this day. I mention how curious it is that there exists quite a bit of synchronicity between her and her great-grandfather. As a young girl, before ever learning that Luigi wanted to own a grocery store, she too nurtured the same dream. 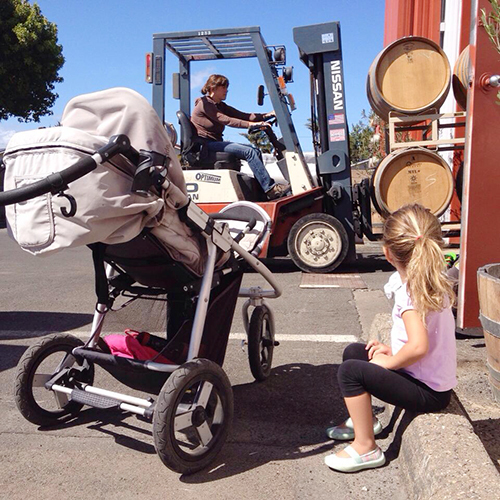 “My parents would take us to the Oakville Grocery Store [in the Napa Valley] when I was a kid. I’d beg them to buy me any piece of fruit I’d never tried before. I dreamed of having a grocery store like that someday. I still do.” And, like her great-grandfather, Thomson loves to garden and loves to can her own vegetables and fruits. “My parents weren’t really into canning or gardening.” Though her parents taught her and her brother early on about the joys of the table, neither parent had any interest in making wine. I find all of these coincidences somewhat mystical, but Thomson is a pragmatist; a child of nature and science, so as I muse about these connections, she shrugs, says little, smiles and continues to work in her kitchen. Thomson looks young for her 37 years. She and her husband will soon celebrate their 20th anniversary. Though they wed in 2008, they began dating in 1998 when they were 18 years old. The Thomsons share a deep, abiding love for the ocean. “I grew up in the water in Northern California. My mom always says that the only way she could get me to be quiet as a baby was to put me in the bath. 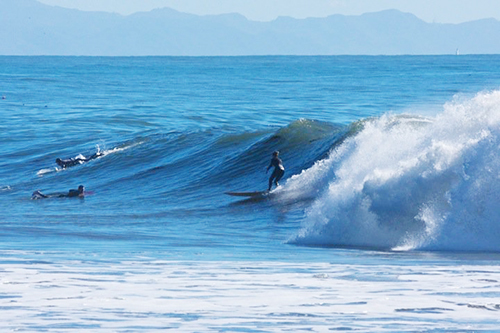 But in Northern California there weren’t as many opportunities to learn to surf. I really didn’t start to surf in earnest until my sophomore year.” By then, Thomson was studying Italian, and also Habitat Restoration, at the University of California at Santa Barbara. Her male friends at the time, including George, told her that they’d teach her how to surf. “I’d like to say that they taught me to surf. But when guys tell you they’ll take you out on the water and teach you to surf, they kind of just take off and leave you at the beach,” she says laughing. “So I just taught myself. It took me a while to get proficient at it. I started in 1998, but in 2001, George and I went to Australia, New Zealand and Rorotonga,” where the couple spent their time “surfing, reading, just hanging out for a few months.” It was there that Thomson became a good surfer. Thomson enjoys surfing alone to clear her head. “The thing about surfing is that it is different each and every time. On smaller days at Devereaux [a local spot where she surfs the most] when the water is clear, you can look down and see the bottom of the ocean. There are rocks and swaying algae and sea grass. Fish dart in and out of your sight. Sometimes a dolphin or seal will pop up right near you. You can look down the coast and see a relatively untouched coastline on one side and Isla Vista on the other. I'm usually looking towards the untouched coastline because that is the direction the waves are coming from. I scan the horizon looking for the signs of a set, paddling around to make sure I'm in the right position to catch a wave. If a wave is coming I turn my board around towards the beach and start paddling. As I'm paddling I look to my left to make sure no one else has the wave before me. Then I look to my right and gauge how this wave is going to break. Once I stand up, it is such a rad view from the board gliding along the face of a wave. Everything is in motion. I've had so many magical days out there when the sun is setting and the glassy water is reflecting the colors of the sky as I’m sliding along. On big days, when you get an especially good wave and you ride by other surfers who are smiling back at you, cheering you on…you feel your adrenalin pumping and that’s one of the best feelings in the world.” Thomson has a calm demeanor, and I ask her if this is due mostly to surfing. She replies that her daily commute to nearby Lompoc, just outside the Sta. Rita Hills appellation of Santa Barbara, occurs alongside the Pacific Ocean, centering her on a daily basis as much as surfing does. 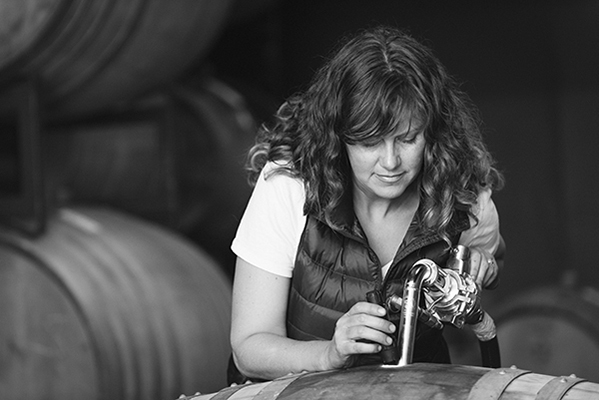 Prior to launching Lepiane Wines in 2013, Thomson held successful stints at Sine Qua Non, as well as Samsara and Palmina, two popular Central Coast brands at which she held the positions of Assistant Winemaker. Because she only produces about 250 cases annually under her Lepiane label, she must supplement her income by taking on wine consulting jobs. 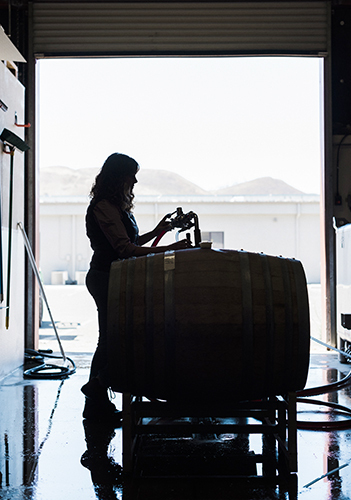 It’s something she enjoys for its variety, currently consulting for several small, emerging Santa Barbara County brands, perhaps most notably Jalama Canon Ranch & Vineyard, known for its cool-climate Pinot Noirs and Chardonnays. On rare occasions when they had a little downtime, Thomson would go on sales calls and wine deliveries with Germano. “He poured me his lineup of Barolos. Each was so distinctive, yet all of them had some of the same core elements. They all had incredibly complex and lively aromatics. There was so much energy in the wines. I sat there smelling the wines, taking them in for quite a long time before I tasted them. I marveled at how they shifted and changed in the glass, revealing layer upon layer of mystery as they opened. In the mouth they were equally lively, complex and energetic. Barolos are known for their structure, and these were definitely built to last, yet they were also completely approachable. I think what I loved most about them was their energy. This might sound cheesy, but they made me feel more alive because they seemed so alive.” I tell Thomson I don’t find that at all cheesy, as her wines make me feel the same way—enlivened by their specificity, focus, vibrancy and freshness. Last year, when Thomson debuted her Barbera at a local wine tasting in downtown Santa Barbara, she was joined by Germano himself, who made the trip to pour alongside her during her debut. He complimented her on her first Lepiane bottlings. She describes that moment as one of the most humbling of her career and life thus far. Currently, Thomson sources her Nebbiolo from one of Santa Barbara County’s more historic vineyards—Rancho Sisquoc, an isolated, beautiful site just on the edge of the Santa Maria Valley appellation. She is also sourcing some fruit from the Alisos Canyon Vineyard, not far from Sine Qua Non’s Third Twin estate vineyard. Her Barbera is sourced from the small, elite Walker Vineyard, on the Alamo Pintado corridor of Santa Barbara’s Santa Ynez appellation. Available for purchase now, her Barbera possesses such an innate, perfect balance that it’s a revelation with food. Each sip invites another bite and so on, a perfect accompaniment to a hearty meal. 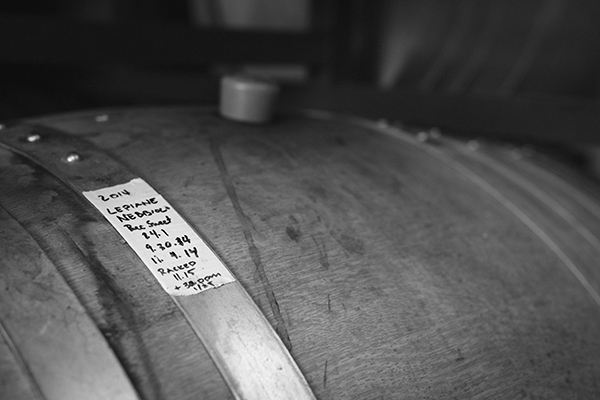 Her Nebbiolo will be released for the first time this spring, and there already exists a waiting list for this exemplary expression of such a noble variety. I’ve had numerous winemakers share with me that it’s the best American Nebbiolo they’ve tasted, and I have to agree with them. Grenache lovers will be interested in knowing that Thomson produced a limited amount of Grenache in 2013. At about $38 a bottle, it stands out to me as one of the best Grenaches I’ve ever had from California, and certainly the finest I’ve had from Santa Barbara County. I tend to favor Rayas, and at the risk of sounding hyperbolic, this sublime little Grenache does that world-class estate proud. In the future, she plans to focus solely on Italian varieties, but for now, she has a small amount of Grenache in inventory. The hours seem to pass quickly while I’m with Thomson. After spending the greater part of a day together, I get ready to head home. Thomson sends me along with a couple of bottles of her wine, including her breathtaking Nebbiolo. A few days later, I decant it early in the morning and serve it to my wife with dinner that evening. We turn off the television and have dinner at the dining room table. I tell her all about my day with Thomson and about Luigi Antonio Lepiane, and how, unbeknownst to him, a wine brand carrying his name flourishes today in the New Country, bringing strangers together at the table, the way he and Rosanna ached to do those many years ago. *Black and white photography by Andrew Schoneberger. All other photos provided by Alison Thomson. Meet the winemaker behind the Napa Valley winery now approaching their 20th harvest. Get to know the man behind kukkula winery in Paso Robles.